The StarTrack® system is an impressive, heavy-duty, railcar containment system engineered to meet specific requirements in either permanent or temporary applications. StarTrack® is surface mounted, and can be installed without moving rails. StarTrack® systems are manufactured from high strength, corrosion resistant fiberglass. Each system consists of sets of three, low profile, 4″ high x 20' long pans. 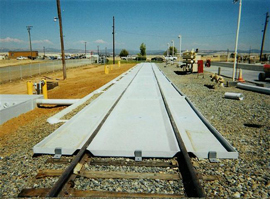 A complete set protects a section of track 20' long by 10' wide. 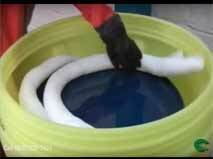 The center pan contains approximately 250 gallons. The two outrigger pans provide approximately 125 gallons each. Each of the pans in a three pan set is connected to the other two pans via a 6″ manifold system which carries spilled material to one side of the track. There a six inch pipe running parallel to the track carries the spill into a holding pond for processing.. The only site disruption is the laying of the 6″ manifold between the rail ties every 20'. In almost every case rail ties do not have to be moved. The STAR TRACK® pans are surface mounted on top of the ties and under the rail crown. Disregarding weather hold-ups the actual installation for this project took approximately two days to complete. Installation may be completed by the customers staff or by Polystar's technicians. Surface mounted for fast, clean installation. No need to remove tracks! Assembly requires standard hand tools. Pans fit tight against rails and are secured by special fasteners. 1/4″ think fiberglass construction for superior strength and excellent corrosion resistance. Several resin options for several chemical applications. Usable in hot or cold climates. UV resistance for long life. Each of the three StarTrack® pans forms a 20′ section, which may be used independently as drip collector pans. Or, the pans can function as a secondary containment system when the pans are connected with one another via a collector trough (8″ wide x 12″ deep x 10′ long sump) which fits snugly underneath and perpendicular to the three pans. Recent designs incorporate a six inch manifold system in place of the collector trough. Six inch drain ports, centered in each pan, allow spilled fluids to quickly flow from all three pans in to the collector trough. A 4″ drain port, located at one end of the collector trough allows captured fluids to flow to a collection pipe running parallel to the track. Multiple 20′ long STAR TRACK® systems may be sited in line to accommodate longer requirements for multiple railcars. 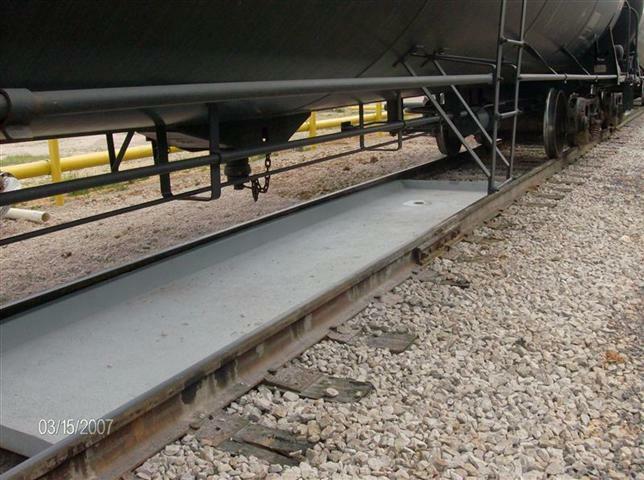 Note: Three sets of Star Track® pans are required to protect the track under an average 60′ rail tanker. First time installations are usually completed by Polystar’s trained technicians. However, future additions can easily be completed by your own maintenance staff or a private contractor. TOUGH NEW REGULATIONS mandate installation of spill containment measures for most rail Tank Car loading & unloading operations. The Star Track® system features rugged fiberglass composite construction to form three (3) containment basins on the outside and inside of each rail to catch spilled material before it hits the ground or enters a sewer system. These basins can be equipped with a drainage system which flows to a large holding tank to handle the really big spills. This state-of-the-art spill control solution complies with local, state, and federal requirements. 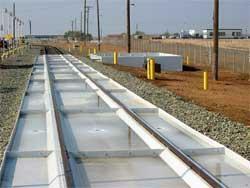 See additional images of our Rail Containment Products in our gallery!